Jacob doesn't mind answering questions about his eye patch, but today he's in a big hurry to get to the store to he can buy a light-up globe. Today is not the day he wants to stop and answer questions from strangers. But everywhere he goes, people are curious and Jacob worries they'll never make it to the store in time before the last light-up globe is sold. 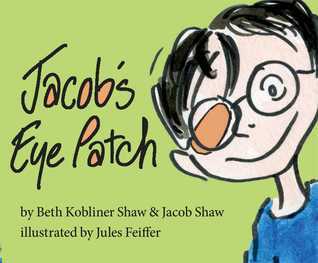 I had to wear an eye patch as a kid so I could certainly relate to this story, but Jacob deals with his patch in a much more good-natured manner than I did since my parents had to practically sit on me to get it on. In fact, they might have actually sat on me if I'm remembering the story my dad tells correctly. I didn't dislike my eye patch because I was self-conscious though -- I was too young for that. I just hated how itchy it was and threw a tantrum because it was uncomfortable to wear. But I digress. This is a lovely book that helps kids understand that we all have our own issues we must deal with and we can choose to either deal with them bitterly or good-naturedly. While this is not the best book I've ever read about celebrating differences, it is certainly one that is relateable and easy for kids to understand. And it most definitely secured a place in my heart since I know what it's like to have to wear an eye patch as a kid.